Product prices and availability are accurate as of 2019-02-22 17:33:29 EST and are subject to change. Any price and availability information displayed on http://www.amazon.com/ at the time of purchase will apply to the purchase of this product. 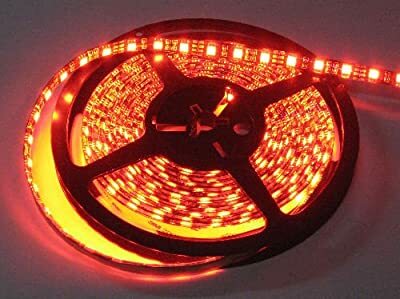 Waterproof LED Flexible Ribbon Spool - 5050 Series - Red LEDs Can be separated in every 3 LEDs along the cut-edge (approx. 2 inches) Made of a flexible black printed circuit board with self adhesive 3M tape Available in various colors: red, yellow, blue, green, white, warm white and RGB Available in various backing: Copper, White, Black Standard length: 5 meters (16.4ft)/reel Strip width: single color 11mm, Color of PCB: Black, Silicone PVC encapsulated, super flexible Color: Ruby Red Working voltage: 12 Volt DC (24v Optional) LED quantity of entire strip: single color 300pcs, RGB 150pcs LED Density: Double Density = .75" LED spacing - Provides high output and more even light output Lifespan (approx. 100,000 hours) Wattage: 72 Watts per 5 Meter Spool Water resistant/Rustproof IP-66 rated Impact resistant, conforms to irregular surfaces, super flexible and low profile, energy saving, low voltage, water resistant/waterproof Waterproof Flexible LED Ribbon lighting comes in five meter spools and is very thin and flexible compared to traditional linear lighting. They are extremely durable and energy efficient which can significantly reduce your energy and maintenance costs for many years to come. Our Waterproof Flexible LED Ribbon lighting can be used in a wide variety of applications, such as signage, channel letters, back-lighting, panel edge lighting, under cabinet lighting, landscapes, fountains & water features, step and stairs, motorcycle and automotive lighting, marine and recreational vehicle, retail and display case lighting, glass art, coaches and limos, home theaters, media rooms and more! Let your imagination be the limit of the design! Need an LED Power Supply to run your LED Flexible Ribbon or LED Pods? Our 100W 12vDC Power supply will run a full spool of single color 5050 LED Flex Ribbon! Can be custom ordered on a WHITE or traditional COPPER colored backing tape. 2-4 week lead time for custom orders.